To contact the committee about technical issues or other comments on this site, email CUNYMath. For issues regarding mathematics courses, professors, exams, homework, or other school-specific topics, please contact your school’s mathematics department. I am teaching a high school CUNY COMPASS math-prep class and I have been giving my students practice tests, but I have not been able to find information about how the assessment is graded. Is there a scale? How much is each question worth in each section? 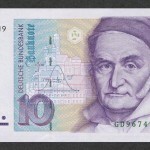 Mathematician Carl Friedrich Gauss was featured on the 10 Deutsche Mark bill in 1993.